My waters broke at 2.30AM on August 26th....Yep in bed...OF ALL PLACES! It was a bit of a shock. I was just 34 weeks, and I was already booked in for a c-section on the 9/9/16. I shouted to wake Gav up, hopped out of bed, then waddled into the shower to rinse off my legs. After calling the hospital from the shower, I grabbed a clean pair of underwear, and my hospital bag and off we went. On the journey to the hospital we were so calm. I had a few tinges, but nothing too strong. Of course I didn't want to pay to park, so we parked up on the road outside and made our way in. The hubby sent a snapchat a photo of me to his mates, saying "even in labour, she'll prefer to walk, rather than pay to park!" The hospital was so peaceful. I was popped into triage and had 2 monitors placed on my tummy. Getting 2 heartbeats is tough! Then like a massive wave the contractions hit me ...WHAM BAM! The midwife didn't seem too concerned at the beginning, but soon my contractions were only 5 minutes apart. She swiftly took us to a private room on the consultant lead labour ward. Within 30 minutes my contractions were lasting 30 seconds, and I'd have 90 seconds break before they'd start all over again. I was frantically asking for them to check how dilated I was, but they said a consultant would need to review me first as I was early, and they could cause an infection if I wasn't actually in labour. ARE YOU KIDDING ME? I don't generally leak gallons of fluid, and have the sensation that I'm being kicked in the back by a horse! Of course all the consultants were in theatre, so I had to wait! My fear was that the babies were coming soon, and they would be put in the danger that everyone had told me we needed to avoid. They wanted me to lay still on the bed so they could monitor the babies heart rates. I couldn't lay on my back. I wanted to walk around, and walk off the pain. I asked for pain relief. Then they offered me gas and air. OH MY GOODNESS...That just made me feel sick, as well as having the back pain. They wouldn't let me have any other pain relief knowing I was off to theatre shortly. Gavin was asked to pop on some scrubs. His trousers were so tight. I was in SO much pain, but that did make me chuckle! The midwives were trying to take blood, but couldn't find a vein. They needed to find out if my iron levels were still dangerously low, as per my previous blood test, and told me I'd need to wait for those results to come back before I would be allowed to theatre. After throwing an almighty diva fit, stripping off naked, they brought a consultant down to see me. She was very calmly asking me questions. I had no idea what she was going on about, and Gavin mainly answered in my absent mind. All I could think is.... GET THESE THINGS OUT OF ME NOW! She managed to get a cannula in my hand, and after about 20 minutes said we could head to theatre. I was still pretty stroppy at this stage, and on the brink of a panic attack. They offered to push me down to theatre, but in hopes it would speed the process up I walked myself. A gown covering my front, but my arse hanging out at the back. I really didn't care! I then had to go through another 5 contractions before they were ready to put the epidural in. I remember the aenethetist saying I must keep really still. My legs were swinging over the side the operating theatre, as I couldn't reach the stool. The pain of each was making my shake intensely, and I was shivering so badly my teeth were shattering. Gavin held me from the front. I cold feel the intensity of his and my emotions all in those few minutes. I had to go through one more contraction, and then gave them the all clear to go ahead. Within seconds I felt normal again. They laid me down, and Gav sat down next to me. I don't think I'll ever forget the pale complexion, and beads of sweat on his forehead. 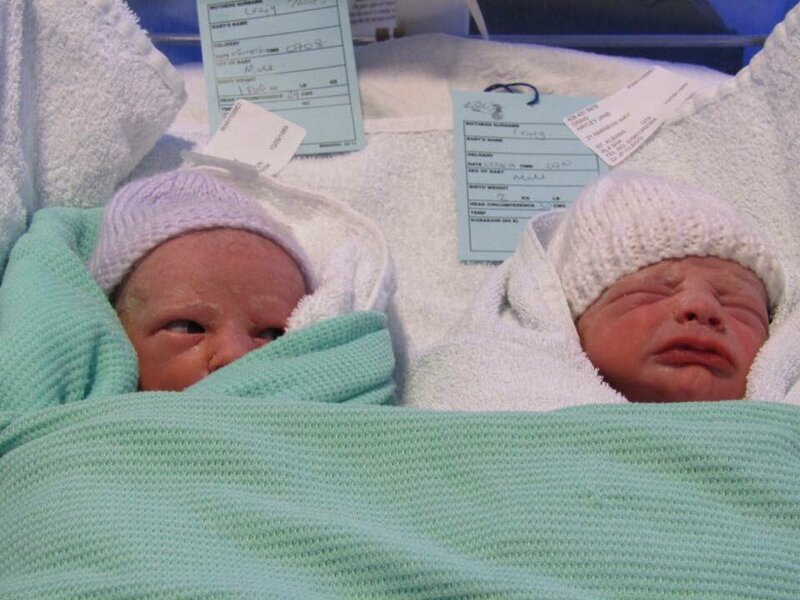 Our boys were delivered safely into the world by 7.08/7.10AM. Moments of pure joy that they were finally here, was quickly over as they whisked them off quickly to intensive care. I told Gavin to go with them. It was an odd numb feeling. They had been with me every day for 34 weeks, and now gone. Not so much as a look at them. Gavin had taken a photo to show me, but that was it. There wasn't any space for me on recovery, so I was taken back to the labour ward. My mum was there waiting. Gavin returned shortly, frantically asking for nappies etc. He'd said someone had confused him for a doctor in his scrubs! After a few hours I started to get the sensation back in my legs. I think I was slower to recover then normal, so they put an strange machine round them to wake them up a bit. They shuffled me into a wheelchair, and took me into neonatal. Harry was in the HDU, after having breathing difficulties. Ollie was in intensive care (the room opposite). I could hardly see them. They were in an incubator, and I was so low in the wheelchair. They looked so fragile! I can't say I instantly felt like a mum. Was that wrong? Then the midwife suggested I help them by expressing milk that they could syringe to them. I had no desire to breastfeed before, but when you see your babies suffering I guess your heart takes over.